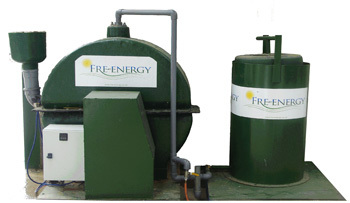 Adequate feedstock supply is essential for the successful operation of an anaerobic digester. 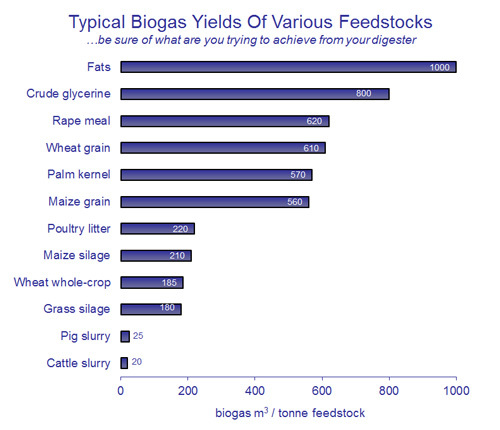 Biogas yield predominantly depends on the type of feedstock used. Slurries can successfully be digested on their own (if not too watery). High strength wastes are best co-digested with lower strength wastes, e.g. food waste is best co-digested with slurry. Co-digestion, i.e feeding the digester with a combination of feedstocks, increases the nutrient quality of the digestate and produces a higher biogas yield. Imported organic wastes, e.g. crops, spoiled silage, grass or food processing wastes, contain a significant amount of energy that is “locked up” within the chemical structure of the waste material. During the anaerobic digestion process, bacteria break down the structure releasing the energy in the form of biogas, and valuable nutrients in the form of digestate. Accepting that energy output is feedstock type dependent, tonne for tonne these wastes typically produce between four and ten times as much energy. Importing wastes creates an additional revenue stream and also has a significant environmental benefit; as both the nutrients and the energy from these wastes can be fully utilised, instead of being wasted by composting or being sent to landfill sites. Farms utilising brought in wastes through AD processing will reduce, or potentially negate, the need to purchase expensive, unsustainable chemical fertilisers.